Explanation: In the centre of a swirling whirlpool of hot gas is likely a beast that has never been seen directly: a black hole. 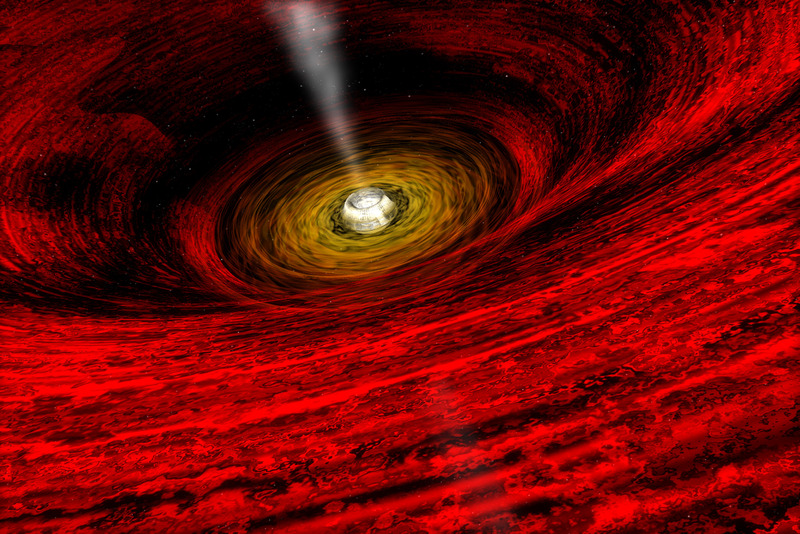 Studies of the bright light emitted by the swirling gas frequently indicate not only that a black hole is present, but also likely attributes. The gas surrounding GRO J1655-40, for example, has been found to display an unusual flickering at a rate of 450 times a second. Given a previous mass estimate for the central object of seven times the mass of our Sun, the rate of the fast flickering can be explained by a black hole that is rotating very rapidly. What physical mechanisms actually cause the flickering -- and a slower quasi-periodic oscillation (QPO) -- in accretion disks surrounding black holes and neutron stars remains a topic of much research.